For small-gig rock fun, the JC2112RC performs way beyond its humble price. Simple, portable, good sounding: a hit! Simple, quality design. Sounds way beyond its price. For small gigging and realistic recording volumes this is a great sounding amp. Don't ask what the 333 label is all about! The controls are clear and make it easy to dial in a good sound. Yep, it is indeed that Soldano. How about a quality valve amp that sounds great, with neither bells nor whistles, at an affordable price for everyday musicians? Founded in 2009 in Seattle, Washington, that's exactly what Jet City is all about. The company is headed up by ex-Loud Technologies/Blackheart colleagues Dan Gallagher and Doug White, plus, wait for it... Mike Soldano. Now you're listening. "This ain't an amp for players who like to program a bunch of different sounds and then select them with several footswitches." Soldano, of course, is a legend in guitar amplification. His were the hand-built, no-compromise heads that stood behind Clapton, Knopfler, Lukather, Gary Moore and countless other heroes in the eighties and nineties: he still makes them and they still cost limbs. Now, however, his design nous is available to all via Jet City, so just how do you compromise on no-compromise? You start by designing your amps in the US and building them under strict quality control in China. Jet City makes much of the fact that the three key parties - Gallagher, White and Soldano - are free of penny-pinching corporate pressure, and that Soldano has carte blanche with design. Nevertheless, offshore build is essential if you want to hit these price points. "We chose our contract manufacturers carefully and we're really happy with the processes of development," comments Gallagher. "What contributed most to reducing the back-and-forth was the straightforward simplicity of Mike's designs, though we did put a lot of time and effort into the output transformer - it was made specifically for us, and we revised it several times to get it just right." Simple is the watchword. The JCA2112RC is descended in part from Soldano's existing Astroverb 16 with a single-channel design that uses a number of valve stages to span clean through to heavy distortion sounds - just balance the top-mounted preamp and volume controls for the response you need. Then there's a tone network for treble, bass and middle attenuation, and finally the presence control, which works in the global negative feedback loop. 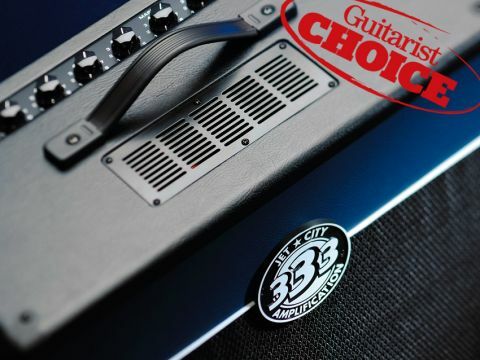 According to Jet City, turning it up reduces the amount of post-output signal that's sent back to the phase inverter stage (the last valve in the preamp), which therefore results in a brighter, more immediate response. Indeed it does. The short-tank spring reverb is valve-driven - send and return - and that's it: no channel-switching, no push-pulls, no confusion. As a result, this isn't the amp for players who like to program a bunch of different sounds and then select them with several footswitches. Moreover, it's for people who like to use the guitar's volume control and maybe a pedal or three to feel their way to their desired textures and response. The power section relies on a pair of EL84 valves that put out a claimed 20 watts. The bias is fixed, though can be adjusted with an internal trim pot by a tech when changing valves. The chassis is mounted vertically, like a Vox AC30, and thankfully the handy top ventilation grille is big enough to enable valve changes without having to take off the whole back panel. When you do, you'll find a custom-designed PCB secured with screwed metal standoffs rather than more fragile plastic clips. All the valve bases are mounted directly to the board, as are the pots and jacks, which are then also secured to the chassis. What you don't usually find in a Chinese-built, cost-effective valve amp is a quality steel chassis, well constructed ply cabinets, and an all-valve signal path to include the reverb circuit - those are all welcome inclusions in the JCA2122RC. It's all very tidily put together, right down to the black Taurus-style vinyl covering and metal corners. Speaker choice for this nicely oversized 1 x 12 is a 70-watt Eminence driver on a ply baffle. "We have been close with the guys at Eminence for a long time - in Mike's case for over 20 years - and they both really like the voicing of the Legend Series," comments Gallagher. Starting with a Strat's singlecoils and set relatively clean (preamp around two or three, master around six or seven), the JCA2112RC returns plenty of snap and twang with more than enough high-end on tap. The deep, enveloping bass of a higher-wattage 6L6-powered amp is absent, and with the guitar's volume at maximum there's also a gentle, furry edge to notes and chords; a light, natural overdrive that stops things from being too sterile. "There's always a sense of edge to the tone rather than a compressed and controlled modern high-gain sound." In terms of clean headroom the JCA2112RC gets nowhere near Fender's ever-popular Blues and Hot Rod Deluxe, for example, the payoff being a more malleable relationship between the pre and power amp sections at real-world recording and small gig volumes. The front-end brings the smoother, more cascaded distortion, and the power section adds a bigger sense of harmonic character and increasing compression as you turn it up. If you want loud and clean, look elsewhere. Pushing the preamp brings the dirty stuff. It's a classic rock-flavoured distortion that spans a late-sixties bluesy break-up through to a tighter AC/DC-style crunch and on to more modded-Marshall drive in the vein of later seventies classic rock: Blackmore and beyond. There's always a sense of edge to the tone rather than a heavily compressed and controlled modern high-gain sound, though with the mids rolled down, bedroom-level metal riffs are there if you have powerful humbuckers. Depending on the guitar and pickups you're using, and back up at small gig levels, it's interesting to experiment with the treble and presence pots; what might sound slightly harsh in isolation is exactly what you might need to cut through a live mix. There's definitely a sweet spot with everything riding around seven with a good humbucker-equipped guitar. Think heavier moments of Jimmy Page, a bit of Blackmore, albeit at much lower levels than a fire breathing 50 or 100-watt Marshall of course. At this kind of level the JCA2112RC can get ragged around the edges so thinning the bass out helps keep control as the power amp starts to take over as the main tonal and feel determinant; chewy, elastic dynamics that are mother's milk to some players, poison ivy to others: it's a feel thing. The reverb seems very well sorted in that the pot taper makes sense, enabling you to have either some or lots of reverb at any volume level. That sounds simple, but it's surprising what a fight it can be on many amps. Simple, portable and highly recommended for classic rock-leaning guitarists who play at sensible rehearsal, recording and small gig volumes. It will clean up if you knock your guitar's volume down, but this amp really isn't about clean tones. What you get instead is a palpable sense of dynamics and feel with medium to heavy overdrive tones that most bigger amps lack until they're hurting people with volume. Jet City likes this amp best with humbuckers, but we'll happily plug in anything. The amp's spec, build quality and tone belie its humble price, which all adds up to an auspicious beginning for the brand. With other models in the pipeline - including designs from other big-name designers - Jet City is most definitely a name to watch.